WHAT IS IT? 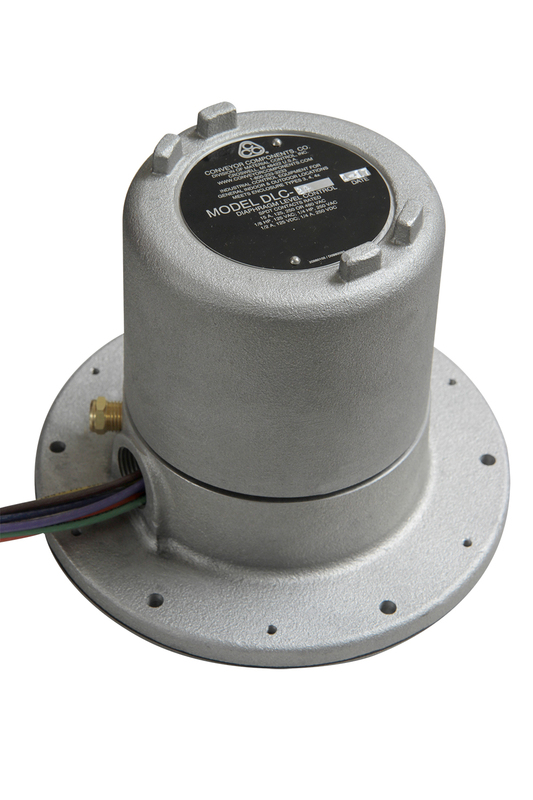 The Model DLC is a flush mount, pressure activated, diaphragm style level control and plugged chute detector. The model DLC has 2 dry (unpowered) microswitches that activate when material within the bin or chute presses upon the diaphragm face. The unit should be mounted on the vertical side wall of the bin, hopper or chute. The unit may also be mounted on the sloped portion of the chute (as long as material flows freely or does not "bridge"). WHY IS IT NECESSARY? The Model DLC can be used as a high level switch, a low level switch, or a plugged chute detector. Additionally, the model DLC may also operate as a material presence control on a conveyor belt, and a high level indicator in a crusher box. The general-purpose controls are designed to meet NEMA Type 4/5 weatherproof and dust-tight environments. The housing/enclosure is cast aluminum. The diaphragm material is neoprene rubber (50 durometer, 0.031" thick) or grade 302 stainless steel. The neoprene diaphragm requires a material density of 25 to 100 pcf for proper activation. Contact factory for use on lower density materials. The temperature range is 32°F to 104°F (0°C to 40°C). The control has two dry, unpowered microswitches rated for 15A @ 120 VAC, 240 VAC, and 480 VAC; 1/2 amp @ 125 VDC and 1/4 amp @ 250 VDC. Each microswitch has a COMMON, NORMALLY OPEN and NORMALLY CLOSED contact. Bronze air vent allows equal pressurization of both sides of the diaphragm. Threaded screw-on cast aluminum cover with spanner wrench bosses and rubber o-ring gasket. The mounting flange dimension matches the Roto-Level Control mounting plate bolt and hole pattern so it can be interchangable with the Model CR unit. Fibre mounting gasket included. Optional black epoxy coating available, add "E" to suffix of model number.